FILE PHOTO: North Korean leader Kim Jong Un and his sister Kim Yo Jong attend an opening ceremony of a newly constructed residential complex in Ryomyong street in Pyongyang, North Korea April 13, 2017. SEOUL - The promotion of North Korean leader Kim Jong Un’s 28-year-old sister to the country’s top decision-making body is a sign he is strengthening his position by drawing his most important people closer to the center of power, experts and officials say. Kim Yo Jong was named as an alternate member of the politburo within the ruling Workers’ Party of Korea - the opaque, all-powerful party organ where top state affairs are decided, the North’s official media said on Sunday. Her youth and bubbly personality seen in state media are in stark contrast to the usually glum generals and aging party cadres who follow Kim Jong Un on official duties. Having previously only occasionally appeared in the background, the young heiress has moved to the front and center of media photos more recently, assisting her brother at numerous high-profile state events. 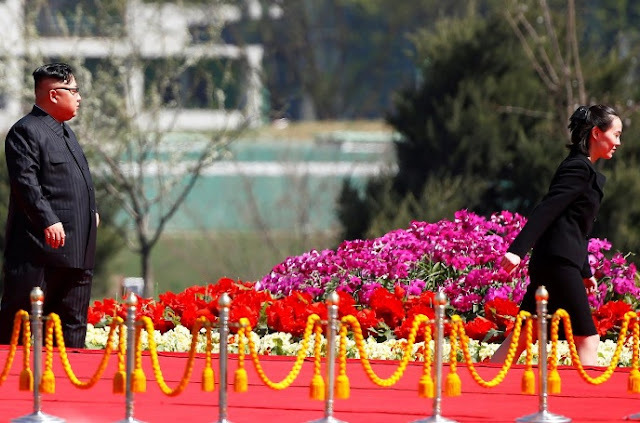 “Kim Yo Jong’s official inclusion in the 30-strong exclusive club of North Korea’s chief policy makers means her role within the regime will be expanded further,” Cheong Seong-chang, senior fellow at the Sejong Institute south of Seoul. Apart from her age, little is known about Kim Yo Jong. She was publicly identified for the first time in February 2011 when a South Korean TV station caught her at a Eric Clapton concert in Singapore with her other brother, Kim Jong Chol. The three, who all reportedly went to school in Switzerland, are full blood siblings, born to Kim Jong Il’s fourth partner, Ko Yong Hui. Kim Jong Chol, the oldest of Kim Jong Il’s sons, does not involve himself in politics, leading a quiet life in Pyongyang where he plays guitar in a band, according to Thae Yong Ho, North Korea’s former deputy ambassador in London who defected to the South. In 2014, Kim Yo Jong was made vice director of the Workers’ Party’s Propaganda and Agitation Department, which handles ideological messaging through the media, arts and culture. The position led the U.S. Treasury Department to blacklist her along with six other North Korean officials in January for “severe human rights abuses” and censorship that concealed the regime’s “inhumane and oppressive behavior”. Last year, South Korea’s former spy chief said Kim Yo Jong was seen “abusing power”, punishing propaganda department executives for “minor mistakes”. In a North Korean state media photo in January 2015, she was spotted wearing a ring on her fourth finger during a visit to a child care center.